Absolute Vengeance is a richly constructed adventure thriller made strong through its painstaking details and compelling characters. As revenge thrillers go, there are essentially two kinds: those in which you hope the vigilante stops before he makes a huge mistake, and those in which you cheer the vigilante on. Absolute Vengeance is the latter, and that has everything to do with Lemoine’s sympathetic setup and choice of enemy (ISIS). There are no shades of grey here, and no anti-heroes: this is black and white, good versus evil. If you’re already on the Lemoine bandwagon, this will be comfort food. 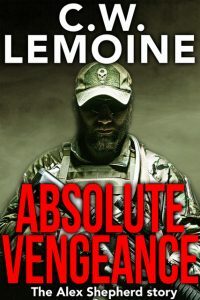 For the uninitiated, if you like Ben Coes and Marc Cameron or the late Vince Flynn, you’ll love Absolute Vengeance. Reading this newest book is like watching a blockbuster. The book is full of actions, tough language, harsh and brutally vivid scenes. So, definitely, neither followers of the Spectre Series nor new readers would be disappointed by reading this page-turner. Absolute Vengeance is a well-written, well-researched war thriller dealing in the area of Special Forces and ex-Special Forces. For readers of the thriller genre, this book will be an absolute winner. It is a fine effort from C.W. Lemoine and I suspect we will hear much more in the future about Alex Shepherd, aka Wolf. Great job by the author.